If you had to make a choice to shut down either the Mars rover Curiosity or that explorer of the Saturn system Cassini, how would you choose? Would you deliver a pink slip to the young, eager, energetic newbie, Curiosity, who's been doing a great job and has only begun its work investigating Mars? Or would you force an early retirement on a veteran explorer who has delivered volumes of knowledge of Saturn and its moons in its nine year career? A hard choice to say the least, especially for two such exciting and high-profile exploration missions, but a decision that could be necessary due to budget cuts at NASA. It's nothing new. Choosing to end a mission earlier than planned has been part of the space exploration budget calculus for a long time. Even the greatest space adventure epic of all time, the Apollo missions to the moon, were curtailed earlier than planned when public interest dipped below a critical cost-benefit analysis threshold. Not every robotic employee of NASA faces layoff or early retirement, however. I recall a time back in the mid 1990's when I worked at NASA's Ames Research Center and was visiting the building across the street from my own. I was walking down a hall looking for someone's office when I passed by an open door and decided to poke my head in. What appeared to be a rather large computer lab opened up before me, and the room had a single occupant: a man probably in his mid-to-late seventies sitting before a computer quietly doing his work. "What do you do in here?" I asked. "I," the man said with a mixture of pride and wistfulness, "am the last employee on the Pioneer mission." Pioneer! Those early interplanetary probes, Pioneers 10 and 11, launched in 1972 and 1973, were still sending signals from deep space. NASA was still listening to them with the ear of the Deep Space Network of radio dishes. In fact, those missions only ended in 1995 for Pioneer 11 and in 2003 for Pioneer 10, when the strength of their radio transmissions faded to silence with great distance. Pioneer's successors, Voyagers 1 and 2, after their primary mission of exploring the giant planets from Jupiter to Neptune, are to this day in an active extended mission exploring the more distant boundaries of the solar system where the sun's outward-blowing gases meet those of interstellar space: the heliopause. And speaking of extended missions consider the Mars rover Opportunity, which landed in 2004 to begin a 90-day primary mission exploring Meridiani Planum and is now entering Year 10 of its extended mission. 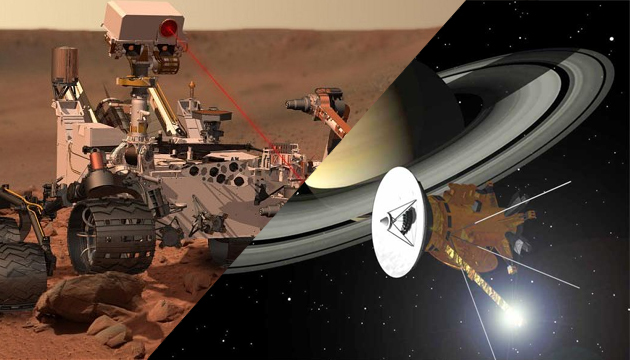 But what about Curiosity and Cassini, NASA's flagship missions of planetary exploration? If the off switch must be flipped on one of them (which would likely happen sometime in 2015), which should it be? On the one hand, Cassini will run out of fuel in 2017 anyway and no longer be able to make orbital corrections that have allowed it to target close flybys of Saturn's moons. On the other hand, with the wealth of information still pouring from Cassini's radio transmitter back to earth, how can we shut off the fire hose early? As for Curiosity, which is preparing to begin its climb up the slopes of Mount Sharp, the basis of the decision takes on a different form. Whereas with Cassini it would be a decision to cut off the flow of goodies we've been enjoying for years, at this point the goodies that Curiosity promises to deliver are still only potential. Curiosity has sent back good intelligence on the chemistry and geology at the foot of Mount Sharp. But the design of its mission is to analyze the stack of sedimentary layers of the mountain that were built up over a major portion of Mars' past, probing the history of Mars in addition to its geography. Early retirement for a proven veteran with volumes of discoveries to its credit or pink slip for a rising star with a promising career ahead? If ever NASA needed an "easy" button….